Game 7 of the Stanley Cup finals in Vancouver was tonight, but about 30 minutes after Boston won no one was talking about the Cup anymore. 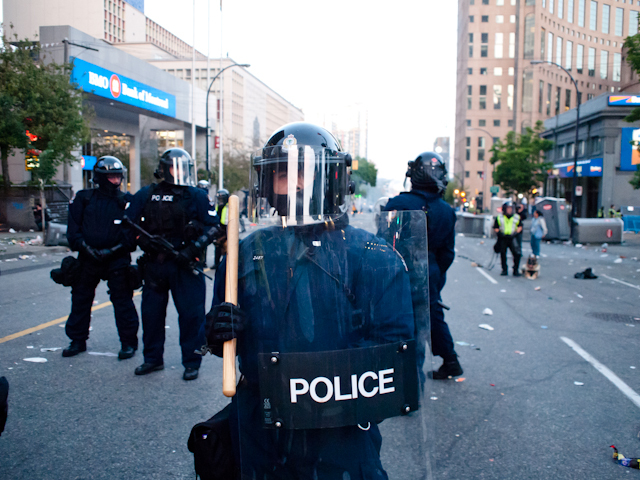 downtown Vancouver started rioting pretty much immediately after the game. fights broke out, cars lit on fire, store windows smashed and looted, and police in full riot control. it was (and still is) pretty disgusting for Vancouver. i would have taken more pictures, but a few guys decided that they didn’t like me taking pictures and threw my camera to the ground and tore up my shirt. the camera actually doesn’t look too bad, but the frame inside is nicely twisted. How does the shirt look? Crazy shots Ian.